Homes with swimming pools are few and far between at the lower ends of the price range, while they're almost a given in the more expensive homes. What percentage of homes have pools? Phoenix and Scottsdale sit at opposite ends of the spectrum on this one, with Phoenix having the lowest percentage of homes with a pool, and Scottsdale having the highest. 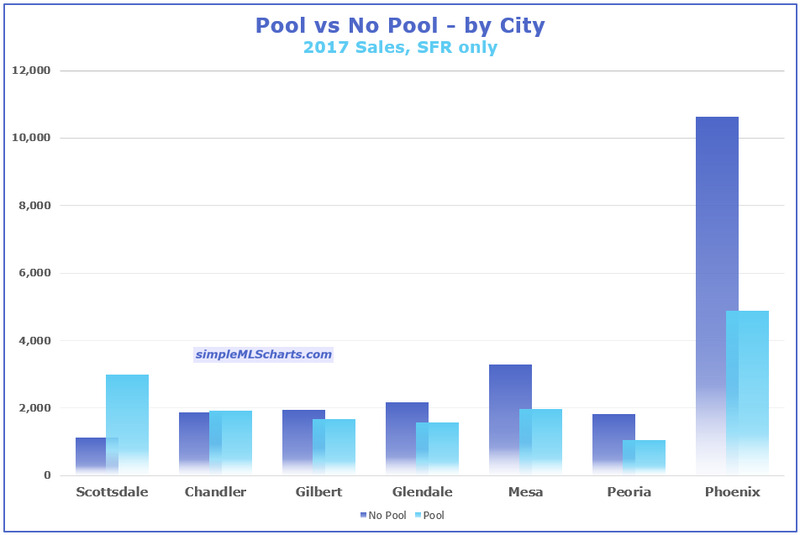 It looks like the percentage of homes with a pool follows the median sales price numbers, with the more expensive cities having a higher percentage of homes with a pool. Does a swimming pool add $100,000 in value? This is deceiving - my guess is the lower-priced neighborhoods have more homes without swimming pools, while most homes in the higher-priced neighborhoods have swimming pools. So we're comparing median prices from different priced neighborhoods. The chart makes it look like a home with a swimming pool is worth a lot more than a home without one, but that isn't necessarily true. This is a case where the numbers don't tell the whole story.